Instead of engineering a revival of the media magnate, whose party is now ahead of the Democrats in the polls, Italy's Pier Luigi Bersani should be trying harder to woo Beppe Grillo, who, despite his contradictions and megaphone political style, has a programme that is much closer to the traditions of the Democrats. Once clear favourite to replace Mario Monti as prime minister, he’s now fighting for his political survival. 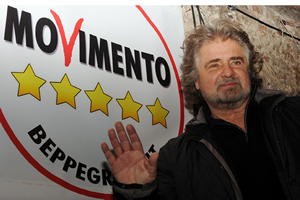 Parliamentary elections in February denied his alliance enough votes to govern alone and the upstart Five Star Movement led by comedian-blogger Beppe Grillo rejected offers of a deal. This week Bersani chose to back a candidate, Franco Marini, for President that split his party and failed to garner enough votes to project him into the job as head of state, leaving egg all over his face. The Five Star Movement is strong on the environment, opposed to privatising public services, committed to universal access to state education and heath, opposed to European inspired austerity and committed to a ‘citizen’s wage’ to tackle widespread poverty, as well as a clamp down on the kind of corporate cronyism and excess that helped lead to the 2008 financial crisis. There’s plenty of important policies missing from Grillo’s programme, including the attitude to Monti and Berlusconi’s deregulatory labour reforms and taxation in a country with 280 billion euros a year in tax dodging, but the Democrats are equally flawed on that front. Furthermore, Grillo’s scourge against the Italian political establishment, often dismissed as Pirate style ‘a-politics’, in fact revives the moralizing crusade that was once championed by historic communist leader Enrico Berlinguer, but has all but been forgotten by left leaders since. Unsurprisingly, although Grillo stole votes from across the political spectrum, there’s more left-wingers supporting him that right-wingers. Why you complete idiot, since when is the populist, know-nothing, anti-politician rhetor Beppe Grillo – a “comedian” who has not been funny for twenty years now – anything to do with the left? Don’t you realize that you are seeing a more farcical but not less self-righteous reincarnation of Mussolini, eager to silence Parliament and take power in the name of his proclaimed, mystical identification with The PEEPUL? I will admit that Bersani has the Devil’s choice – Berlusconi and Grillo, two utterly untrustworthy villains. Perhaps Italy deserves this for having voted for these swine. But to call Grillo a man of the left is to call Mussolini one.